The Line: A Colouring Book is a unique take on an activity book. Completely black and white, except for a red line throughout, and with no words, this is a book that can be treated as a colouring in book, or read as a story in its own right. It starts with a tightrope line with animals balanced upon it. When you turn the page, the red tightrope becomes a clothes line with clothing pegged on it. On the next page, the line which was straight becomes a rope hanging to guide a queue of people. As the book proceeds the line changes shape and form. There are people, animals, and recognisable activities like decorating a Christmas tree and visiting an art gallery, along with less usual activities like exploring the jungle. Follow the line from start to finish, then colour in the illustrations. 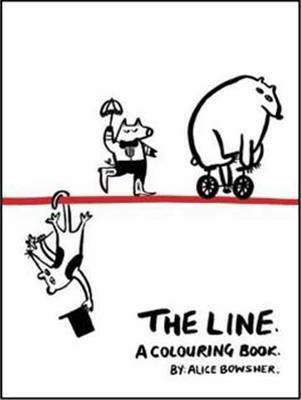 The Line: A Colouring Book is a surprisingly simple, yet enticing book.